I normally only review books that deal with peacebuilding or comparative politics directly. I may be breaking my own rule here a bit. Even though Kara Ellerby’s No Shortcut to Change, does cover both comparative politics and peacebuilding, it is really about feminist theory, which is far from my own (alleged) fields of expertise. In fact, the book raises important issues those of us who work in my two fields take to heart. That starts with the phrase she uses to start the book and which, she claims characterizes her field, “add gender and stir.” Whatever the problem, she suggests, the “recipe” is to add more women, more women-sensitive policies, and the like. She does not disagree with such initiatives, but she doesn’t think they go far enough in addressing what she and other feminist theorists call “kyriarchy” or the interconnection of systems of power and oppression. Ellerby does a tremendous job of documenting inequalities that affect women, including in the fields I most care about. Thus, she shows that while the number of women in positions of authority and other indicators we comparativists worry about has grown appreciably, little has changed regarding the overall status of women. And that makes me happier, too, because as a peacebuilder, I know that we have to integrate gender issues in everything we do (Ellerby agrees) but that gender issues have to be part of a larger effort to reconfigure power and the way it is exercised. Ellerby doesn’t quite get there in this book, but it is her first one, and I look forward to the thought provoking ideas she will have in her next one. 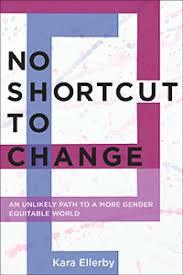 In short, a book that will challenge just about anyone’s ways of thinking.